My boys love to spend time outside. It doesn't matter to them what the temperature is, -40 or +40 and they will be asking me to go outside and play. I LOVE this about them. 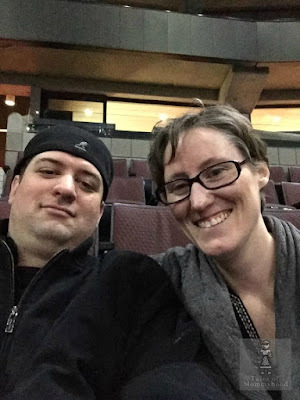 They have such diverse interests like climbing trees, playing video games, inventing games with their imagination, and in the winter climbing snow banks and having snowball fights. Living in Ottawa, our winter temperatures can vary, and it could be -40 with windchill one day, and -5 no wind the next. We need to be prepared for it all, and the cold doesn't stop our lives from continuing. I was introduced to Baffin Boots 2 years ago, and I fell in love with them. 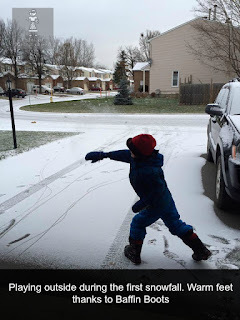 It was the first winter I played outside with the kids without having cold feet. 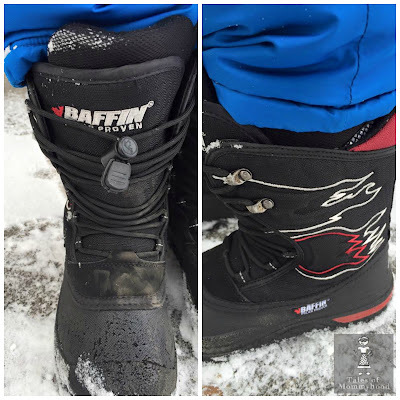 Both the boys needed new boots this year so I decided to check out Baffin's kids line. I love that they have boots with coverage to -60. Mr. K's boots are good to temperature levels of -40, and Mr. J's to -60. His boots are the Flame Jrs and have the fastener to tighten the straps, which I find works well for the little ones. It's super quick to get them tightened. We are having fairly mild temperatures, and only one day of snow (with a very little amount) that they haven't had a good chance to test them out. Mr. K wore his to school the day we had our first (and only) snowfall. 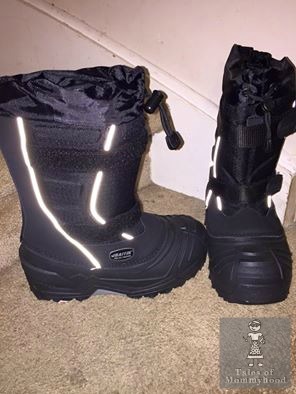 These boots have velcro straps across the front, and a fastener at the top to tighten the gap. They are a little bulkier than the boots that he is used to wearing, so that is something to keep in mind. They are super warm however, and great for playing outside.